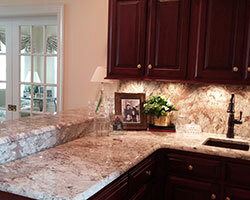 HR Design Remodel has been creating custom specialty spaces since 1989! As our already busy lifestyles become more hectic, the need for a space to kick back, relax and enjoy the little bit of time we get to ourselves increases. Everyone may be different but one thing remains true, whether you’re a media room, a wet bar, deck, or a patio person, we can take your dreams and lay them out in front of you. 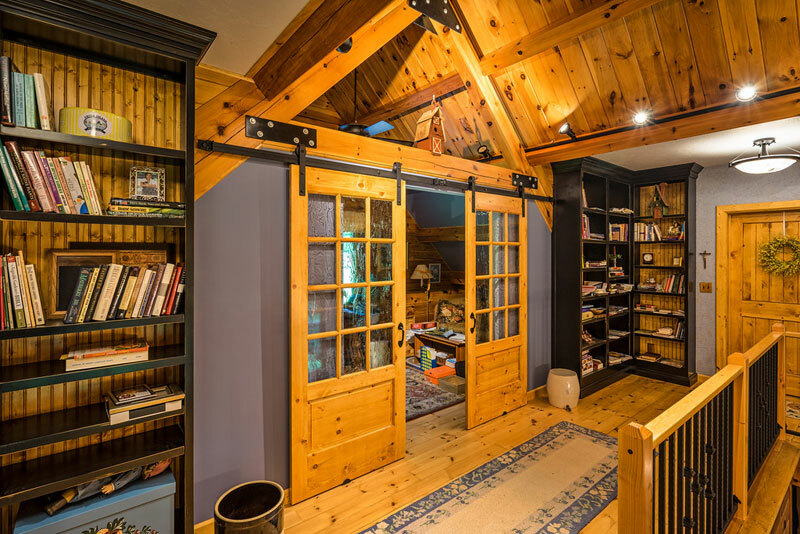 If a custom specialty space is what you are looking for, we can design and build a unique living space that you and your family can laugh, love and create memories in for years to come. 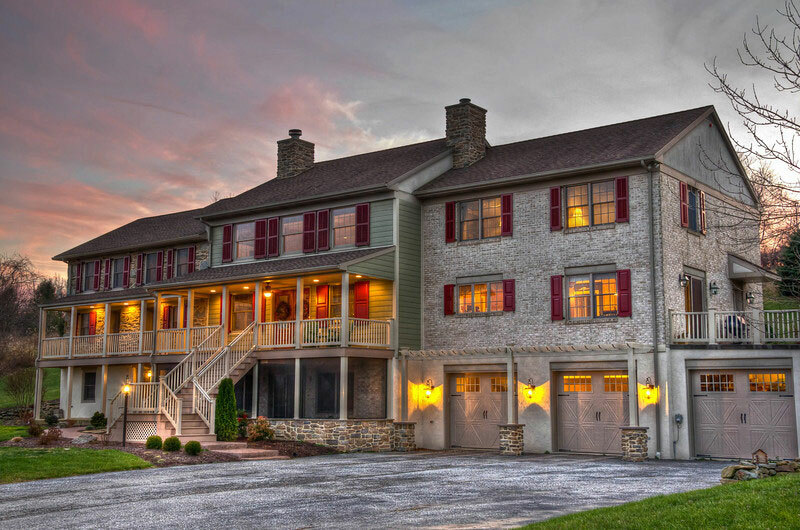 Curb Appeal, Exterior, and Specialties...Oh my! Think curb appeal doesn’t matter? Think the exterior of your home is sufficient? Think again! From the smallest of updates to the grandest of upgrades, these things really matter, whether you are planning on staying in your home for years to come or thinking about moving tomorrow, these three things can make or break the enjoyment you get from your place or the task of putting your home on the market. We love when we can do something that is totally off the board. 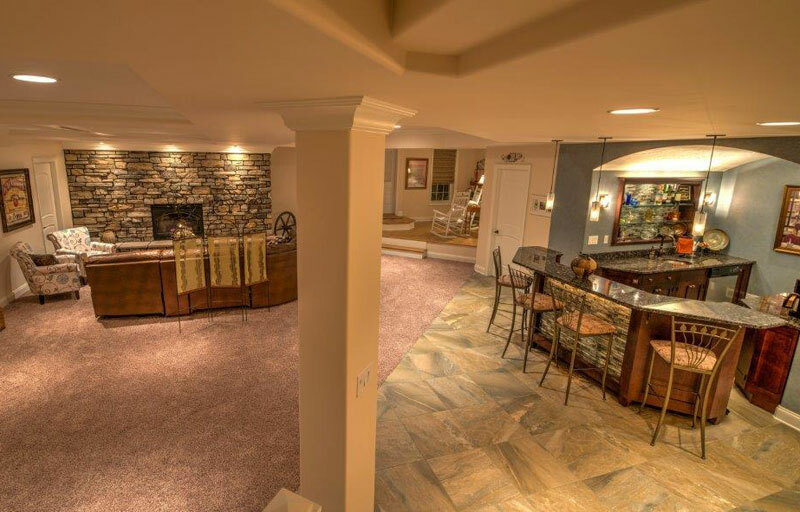 Creative and Full Basement Remodels? Check. Updating the exterior of a lake house out of town? Check. Custom Homes? Check. You get the picture. 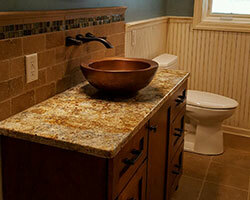 Our Specialty Category also includes custom homes. 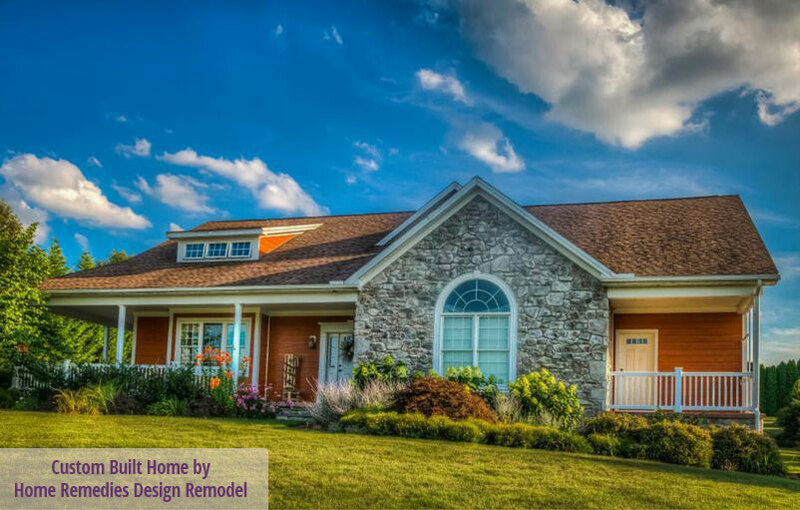 We have built homes created with the highest quality products and materials and superior workmanship that Home Remedies Design-Remodel has to offer. 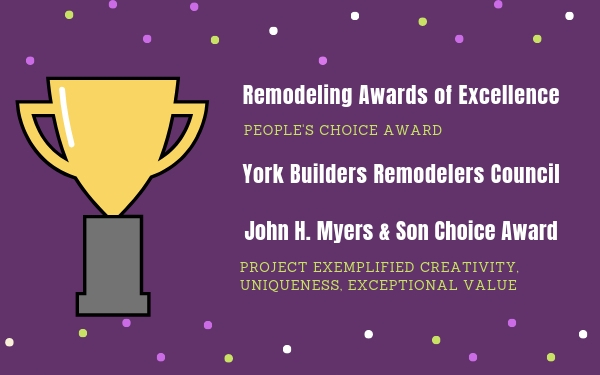 We work side-by-side with you and help you every step of the way to produce a home that reflects your individual tastes, needs and personality. 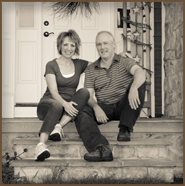 Just ask some of our clients who have shared thoughts with us regarding the curb appeal of their home. One client shared with us in our first meeting regarding the outside of her home “my home is in dire need of a major facelift”. She asked and we delivered. 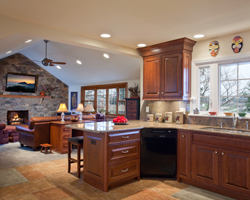 Home Remedies Design-Remodel can reverse a house without even moving it! We call this one Turnabout Country Charm. This project won 3 awards in 2013. 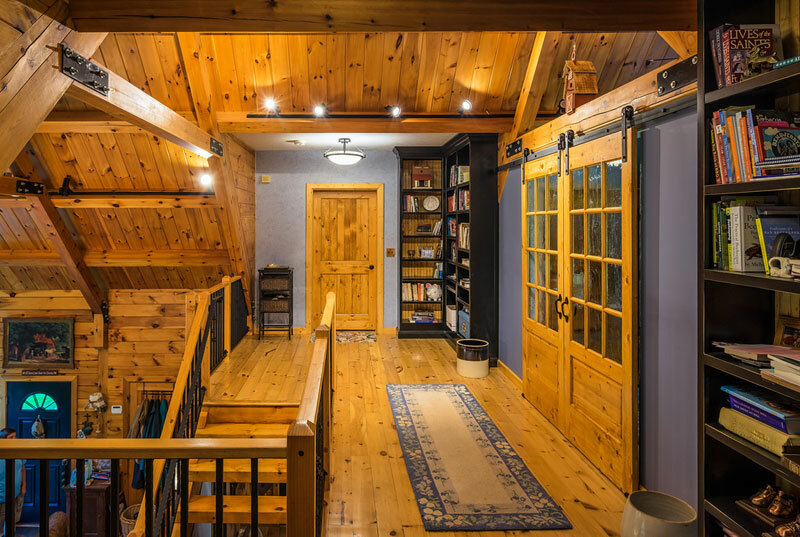 In this case, the entrance to the house was in the rear of the home and we basically, with much thought and planning, transformed the home so the entrance was right front and center as you drove up to the property. 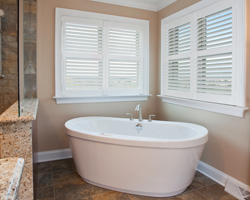 This made all the difference for the client who admitted that our attention to detail and the time Home Remedies Design-Remodel took to gather thoughts and ideas before the project began was the ticket for her to get started. 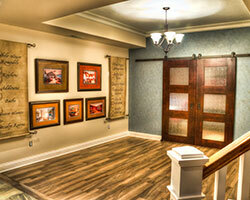 We did this by making a grand entrance to the home to match the upscale feel and added a country covered porch. 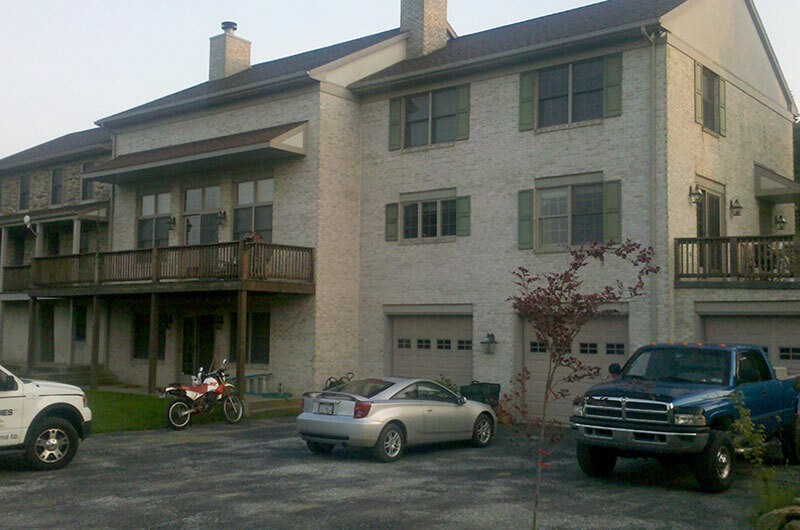 We tied the brick part of the home into the original stone home which required stone accents in chimneys, in front of garage doors and a knee-wall off of the screened porch. All exterior products chosen are maintenance-free AZEK, vinyl railings, weather board by Certainteed siding where brick was removed. This was created to make the center look like the original farm house with stone addition on one side and brick addition on the other. Stamped concrete and walks were added to give it that old-world feel. Garage doors are Carriage style. A Pergola was added above the garage doors to balance out the porches on the rest of the home. A grand entrance was added onto the main covered porch; this was achieved by using a double Provia fiberglass door system with old-style glass. The pergola was also vinyl so as not to create a maintenance issue. A screened-in porch was added below. A grand staircase was built to achieve the entrance now to the "new front" of the house. Now the homeowner loves the look of her home and the feel of it so much that she states that “it is truly a place she and her family love to come home to”. 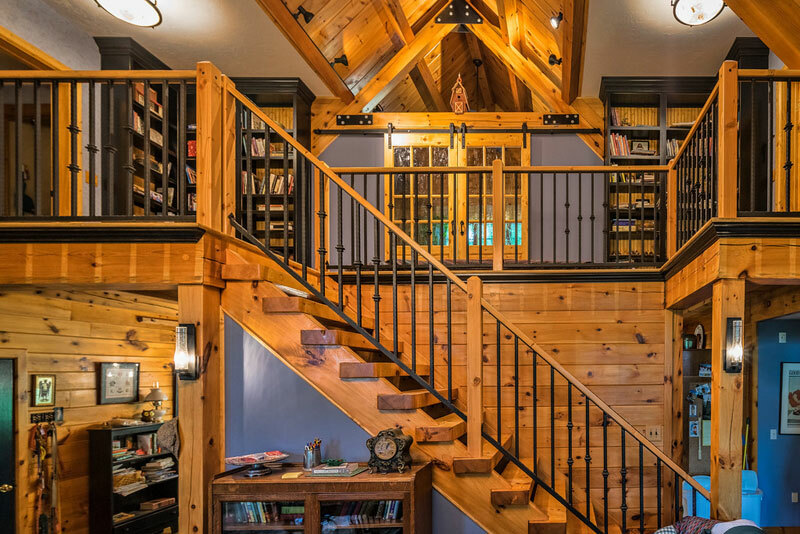 One of our favorite clients who had been surrounded by logs, logs, and more logs in their custom log home had finally decided to change their living space dramatically. 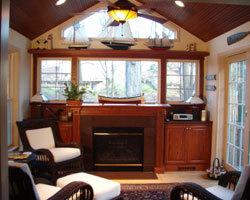 She longed for an updated, modern look with color and “real” walls, not logs. 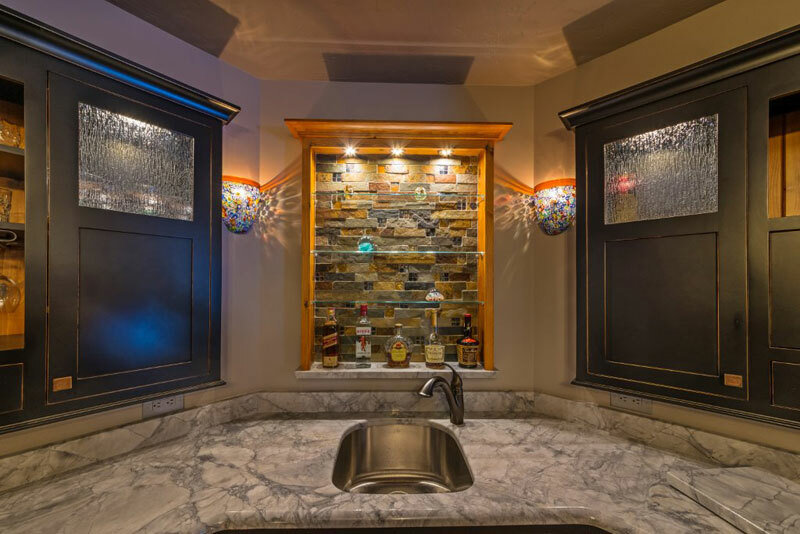 Although they loved the beauty of their home, after meeting with Home Remedies Design-Remodel at a Parade of Homes, it was decided that a “refinement” needed to take place. 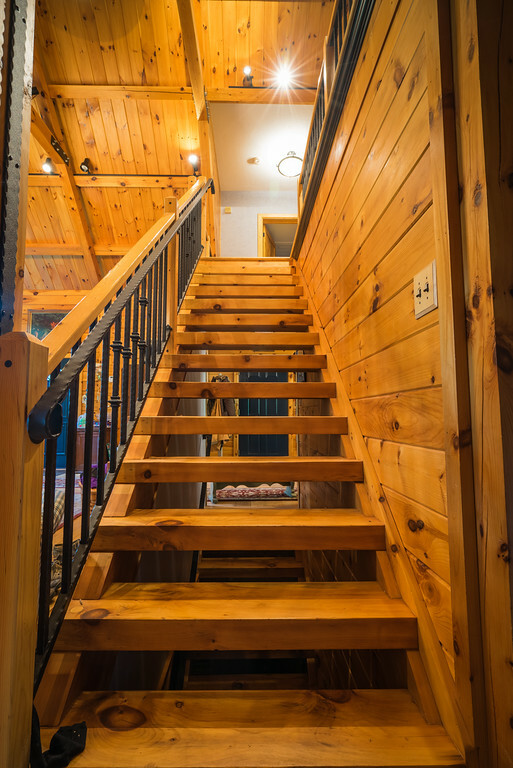 We did just that by blending modern touches with the existing log home feel and they could not have been happier. We updated hallways, an office area and staircases with finished painted walls to add interest, added knotty pine doors. We also added graspable iron handrails for safety, as well as for beauty. 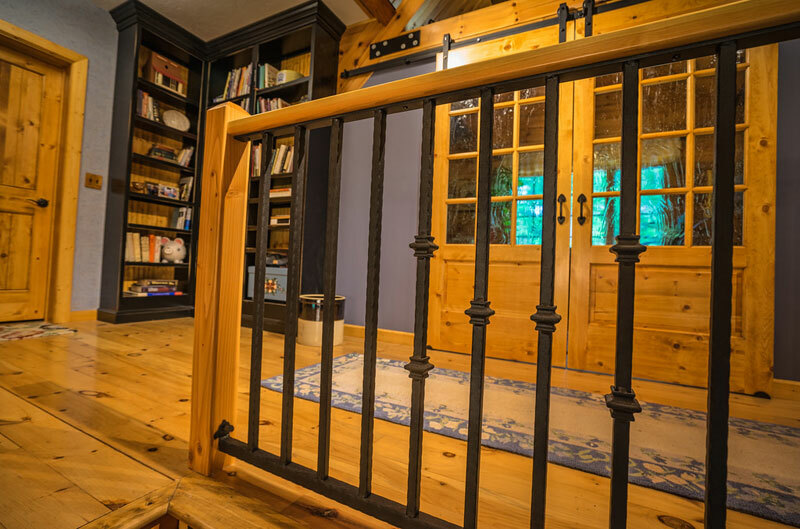 Custom shelving and new lighting gave the whole home a more intimate feel. 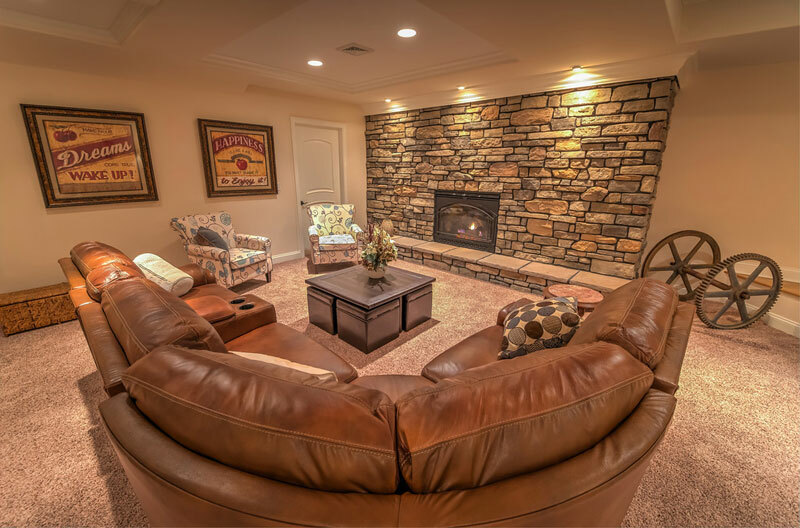 "Come In and Stay While"
Our basement remodels may consist of spaces with bars, entertainment areas, fireplaces, and sleeping quarters. 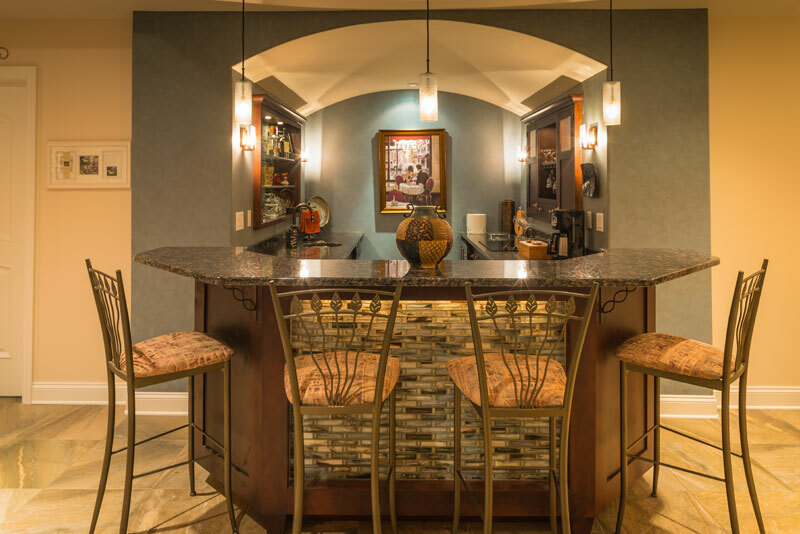 Whatever your need is, we can meet that need and "raise the bar" when it comes to basements. 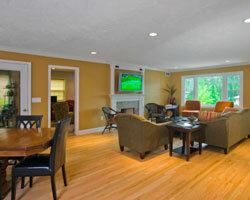 One client desired a cozy place where house guests can feel at home. 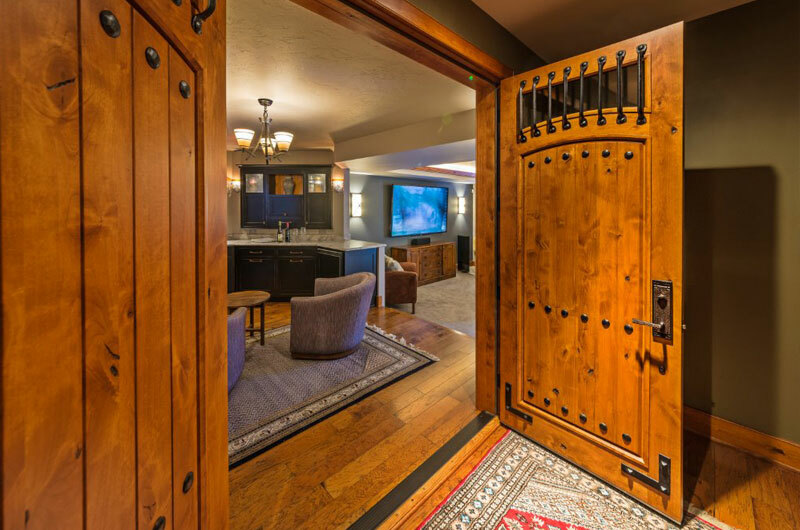 A seating area with a stone fireplace, full bath, custom bar and sleeping area serves as a “mini hotel room” for friends and family who are in town and are only steps away from the main part of the house. Everyone can enjoy time together, and also have privacy when it is time to turn in after a long day of sight-seeing and visiting together. 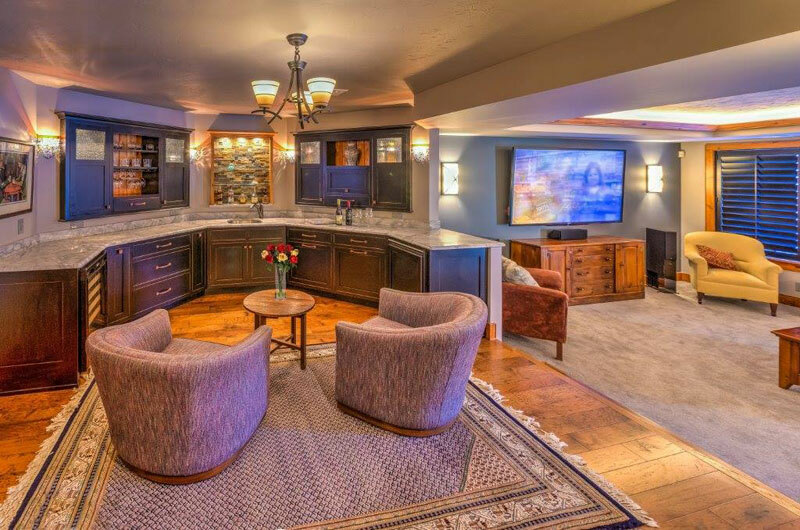 Another customer tells us we “turned their basement into a lounge/bar/movie room” and they love the beautiful design and how it turned out. They now enjoy gatherings with family and friends in a space that is the ultimate in enjoying quality leisure with others, or just a space to hang out in if you’re in need of some alone time with a good movie and your favorite snack. Either way, this remodel simply says “come in and stay awhile”. Another client is also happy with the exterior updates we did with their home stating that Home Remedies Design-Remodel has created beautiful curb appeal by replacing siding with cedar shakes and installing a stunning wood-look entry system, black shutters around the windows, and garage doors replaced with carriage doors. She says “we love everything we have done to our home and wouldn’t change a thing! Through consultation, planning and creative vision, Rick has been able to transform our house into a functional and beautiful place to live”…and that’s the truth…inside and out! 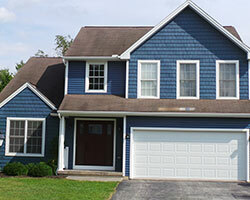 Specialty for us can also mean leaving town for several weeks to redo an exterior of a “lake house getaway” for clients who had a vision to enjoy some of their retirement in up-state PA.
We helped them do just that by updating the exterior of the house by adding color and low-maintenance exterior with shakes, siding, new placement of windows, exterior doors, and a beautiful deck area to overlook the lake and beautiful wildlife. 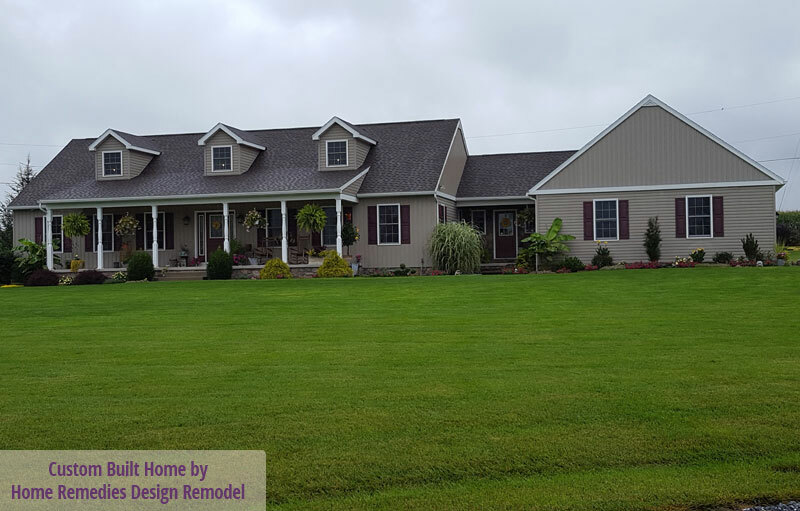 The clients say “we had worked with Home Remedies Design-Remodel for 10 years, they remodeled our original home from top to bottom, never is one detail left out and we never worry about having his trades contractors in our home”, and “when we purchased a vacation home we immediately called Rick to rely on the highest degree of honesty, professionalism, vision and results”. In regards to our clients for our feature “Rustic Home Sweet Home”.... well they have been happy in their home since 2003 and for good reason. 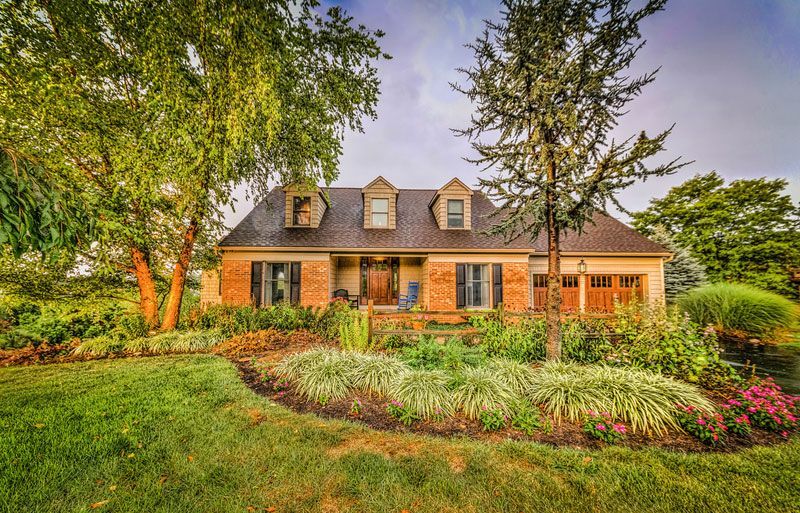 Custom kitchen and baths, full finished basement and wrap-around porches offer years of comfortable, natural surroundings, beautiful views and a place where family and friends can gather and enjoy the company of each other. The main theme that runs through the mind of the homeowner is “ The best thought of my entire day was the just the thought of coming home”! 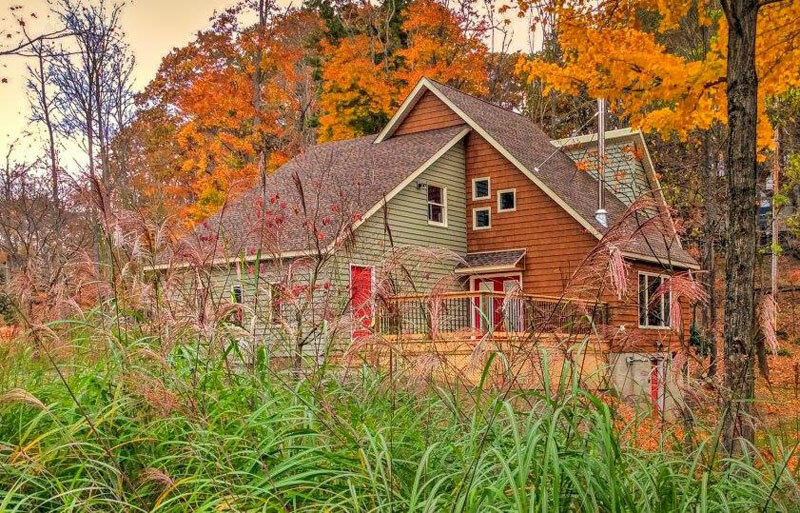 Set on 10 acres, this beautiful Cape Cod-style country home features full length front porch and side-entry porch, charming dormers, vinyl railing, stamped concrete walks. A spacious two-car garage is attached to this three-bedroom, two-and-a-half bath with open dining/kitchen and living room plan. This is modern charm to be enjoyed for years to come. And on a side note, our creations aren't just for living in, seems they are for weddings too! We had the honor in 2017 to attend the wedding at this home in Elizabethtown. On a beautiful autumn Saturday the homeowner’s son got married on the property. You couldn’t ask for a better setting. It was an honor to attend a wedding at a home that we had built for this family years earlier. What a fun wedding and a lovely day all around! Befittingly called "Country Living at its Best!" Contact Us to Discuss Your Vision for Your New Specialty Space!